A ghostly, mysterious boy is found in Lower Delkfutt's tower. Meanwhile, a surreal darkness has filled the crags of Dem, Holla and Mea. An adventurer, sent to investigate, stumbles upon the portal to the remnants of Tavnazia, a once-powerful nation destroyed during the Crystal War. At the base of the brewing conflict is the Twilight God, Promathia, and the believed coming of the so-called Keeper of the Apocalypse -- the one destined to awaken Promathia and cause the destruction of Vana'diel. 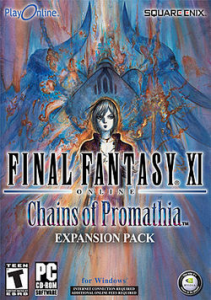 Chains of Promathia was released simultaneously in the United States, Japan, and Europe on September 21, 2004 for both the PS2 and PC. This page last modified 2008-06-08 21:22:21.